I figure in my tenure as a gunsmith I worked on about 500 1911s, and as a writer I've certainly reviewed at least another 100 more. So it gets harder and harder to get enthused about the latest one to arrive. And yet here I am, eager to tell you about the latest. When I was a gunsmith, if you would have told me that Smith & Wesson would be not just making 1911s but setting the bar high for 1911 makers, I'd have laughed so hard I would have snorted coffee out of my nose. I mean, come onâ€”next you'd be telling me they can make pistols out of plastic. But right here on my desk sits a new 1911â€”the S&W Performance Center 1911â€”that would have made any custom gunsmith in the golden era of single-stack IPSC 1911s green with envy. It has all the usual S&W Performance Center detailsâ€”and then some. The expected ones, starting from the top, are an adjustable rear sight, dovetail-fitted front, lowered ejection port and external extractor. There was a great desire in the 1911 universe for an external extractor to address the perceived need to junk the old internal extractor and its "need" to be properly tensioned. Many 1911 makers fumbled the engineering on this, and it wasn't long before they switched back to the internal design. Well, S&W has been making pistols with external extractors for a long time, and when it decided to put an external extractor on its 1911s, the designers didn't have to engineer it from scratch. In fact, it's the same extractor found on the discontinued Model 945 and on the E series of 1911s that Smith & Wesson brought out a couple years ago. But that's not the most distinguishing external feature on this pistol. Forward of the S&W Performance Center logo laser-engraved on the slide you'll find a series of slots on the slide. My first thought was they were cooling vents, which is odd since I've gotten a bunch of 1911s very hot but have never felt the need to add cooling slots. "We call them lightening cuts," Performance Center head honcho Tony Miele told Handguns. "They will perform some cooling obviously, but they're there to lighten the slide. It's a cosmetic thing, too." One thing is for sure: Your shooting buddies are going to recognize this one right away. The rear cocking serrations are the fish-scale pattern that S&W uses. They're aggressive, effective and distinctiveâ€”and, again, no one will mistake your Performance Center gun for another brand. The frame has a high beavertail grip safety and ambidextrous thumb safety. The frontstrap is checkered, while the grips are an aggressively patterned set of Altamont G10s. The areas where your fingertips will hold is checkered, but the rest of the grip is grooved in such a way as to resist movement in your hand. In some ways the grips are too effective. In the process of carrying this pistol through a law-enforcement class, I found the grips were shredding my shirt, grinding little lint balls off the fabric. So if you plan on wearing this gun concealed as part of your daily ensemble, be aware that the grips might shorten the service life of your shirts. The raised and radiused frontstrap has 30 lpi checkering while checkering on the mainspring housing is 20 lpi. The mainspring housing also is a magazine funnel. The barrel is nicely hand-fitted, being snug in closing but not a crush fit. Out front, the barrel bushing sports a bit of technology I haven't seen since custom fitting was at its zenith: a Briley Spherical bushing. The bushing is composed of a ring, shaped sort of like a plain wedding band, assembled inside of a specially machined bushing. A normal 1911 bushing is a bit of steel sculpture that most people don't appreciate. If the bushing is simply a cylinder inside, it won't work. When the 1911 unlocks, the barrel has to tilt down. If the bushing isn't relieved to permit that, the barrel will bind and slow the slide or be lifted at the rear, which will create feeding problems. Gaining enough clearance to provide function, without creating so much slop that accuracy suffers, is a graduate-level exercise in barrel fitting. The Briley Spherical bushing solves that problem in a simple way. The ring tips inside of the bushing housing, allowing the barrel to tilt and yet hold it snugly for accuracy. It's possible to make the bushing body fit so tightly to the slide that it won't ever come out and the barrel is still a snug but free-running fit inside of the "riding band." My recommendation is that you leave the bushing alone when you field-strip the Performance Center 1911, but if your curiosity drives you to it, the band does come out of the bushing body. Those two semi-rectangular clearance slots on the sides of the bushing housing allow that. Once free of the barrel, rotate the riding band inside the bushing body until it lines up with the slots. Then pull it forward. Happy now? Then put it back, and leave it alone. The recoil spring rides over a full-length guide rod, a detail I could skip but is easy to change, and the throated barrel features a precision-crowned muzzle. It mates with a hand-polished feed ramp in the frame. And as an extra boost to good shooting, the Performance Center 1911 has a very nicely fitted and hand-polished Competition Match trigger with overtravel stop. The hammer is what the Performance Center calls its Competition Speed hammer. The first few times I dry-fired the trigger, it felt a bit gritty, but that was probably just dust in the parts. After a bit, it cleaned itself up to a crisp 3.5 pounds and has stayed that way since. Last but not least, the folks at the Performance Center also hand-time the gun, fitting the parts so the barrel stays locked up as long as possible without causing a malfunction. The longer the barrel stays locked up, the better the accuracy. 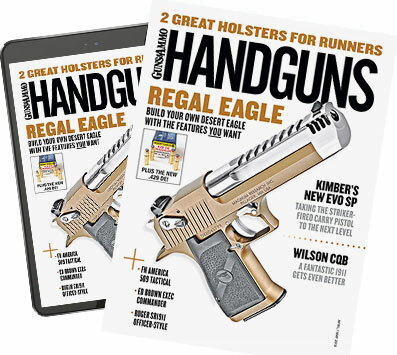 Cosmetics and technical specs are all good, but Handguns readers are the type of folks who ask "How did it work?" before they decide to slap down the plastic. The trigger is a joy, clean and crisp, and lets you wring all the available accuracy out of the ammo you've selected. The grip safety is a bit less sensitive than I would like, requiring that it be depressed at least halfway before it would clear the trigger bar. But that is a minor detailâ€”one I have a problem with due to my hands and one any competent 1911 pistolsmith can adjust in short order. The thumb safety was crisp to push on and off, but the right-hand lever binds against my knuckle. Again, the binding thumb safety is a result of my peculiar, late-1970s style of grip and not something that the Performance Center can be faulted for. The recoil of the Performance Center 1911 is indicative of the fitting that went into it. Having fired an embarrassingly large amount of ammunition through 1911s, I have a hand-sense of the recoil. A really loose gun feels like it is merely a collection of parts working more or less in unison, and on each shot I can feel all the steps of function. A bank-vault-like fit, one a short step away from causing malfunctions, has no steps to it; it simply goes bang, hits your hand, and when you see the sights again it is closed. The Performance Center pistol has a slight "bump" as the slide goes forward and collects the barrel. I wouldn't go so far as to call it a clatter, but I could feel it if I stopped paying attention to my shooting and concentrated on just feeling the gun recoil. But when I watch the sights and focus on shooting, it feels like a bank-vault pistol. As far as accuracy goes, this pistol is a bargain. Off a rest, it was child's play to punch out two-inch groups. My match load, an Oregon Trails 200 grain lead semi-wadcutter over Vihtavouri 310, shot like a Bullseye gun out of the Performance Center gun, which isn't a surprise, as that load is a successor load of one from the good old days of single-stack IPSC glory. The calculus of custom 1911s has changed over the decades. At first, it was "How much do I need to spend to make this pistol reliable and good looking?" In the early days we built custom guns on surplus 1911A1s and poured entirely too much money into details that are now taken care of by modern manufacturing. Things we slaved over are now taken for granted, such as a snug slide-to-frame fit, barrels that shoot small groups and triggers that don't need adjustment right out of the box. For me, when I see the high degree of hand-fitting, hand-lapping and hand-polishing you find on the Performance Center 1911, I automatically figure the price tag is going to be a couple grandâ€”because that's what we used to pay gunsmiths to work over our 1911s. Therefore, when I first read the suggested retail on this 1911, I thought it was a typo. Surely it was $2,500, right? Nope, the price is correct. "As a custom 1911 at $1,500 it's going to be the catch of a lifetime," Miele said. "We really want to own that market." The suggested retail on this S&W pistol, adjusted for inflation, is less than the price of a box-stock Colt in 1979, the time when I was first getting a 1911 built for competition. And that Colt, out of the box, not only did not have all these features, it didn't even work right. The Performance Center pistol not only worked right from the beginning, it has continued to work throughout my testing. My friends who are custom 1911 'smiths will find even more segments of their work now negated. No one needs pay for trigger work or accuracy work on a pistol such as this; it's already built right in. At this price, I have an interesting dilemma facing me. I already have plenty of 1911s, and as a gun writer, my rule is to send back test guns because I can't pay the mortgage with "guns bought as bargains." But at a price like this, how can I pass it up? However, I should point out that hot on the heels of this five-inch Government model, the Performance Center is bringing out a 4.5-inch 1911 built on a lightweight scandium frame, so maybe I'll shoot that one before pulling the trigger, so to speak, on this one.